I love to draw with waterproof pigment ink because if I wanted to paint and water-colour it later, they won’t risk smudging. The water pen is a super convenient invention for artists because you don’t have to carry around water bottles to clean your brush. The tiny water-colour palette was inspired by my friend who showed me hers when I visited her in Japan. Please see here for her tutorial post! The washi sample is especially important for scrap paper collecting. Sometimes when you visit certain cafe or restaurant and you grab a piece of their name card, you can immediately washi-tape it to your planner so that they don’t get lost at the back of your jean pockets. As for my favourite writing tools, it has to be the smooth flowing multi-catridge pens that allow me to color coordinate (red – health; black – events; blue – work) my entries. 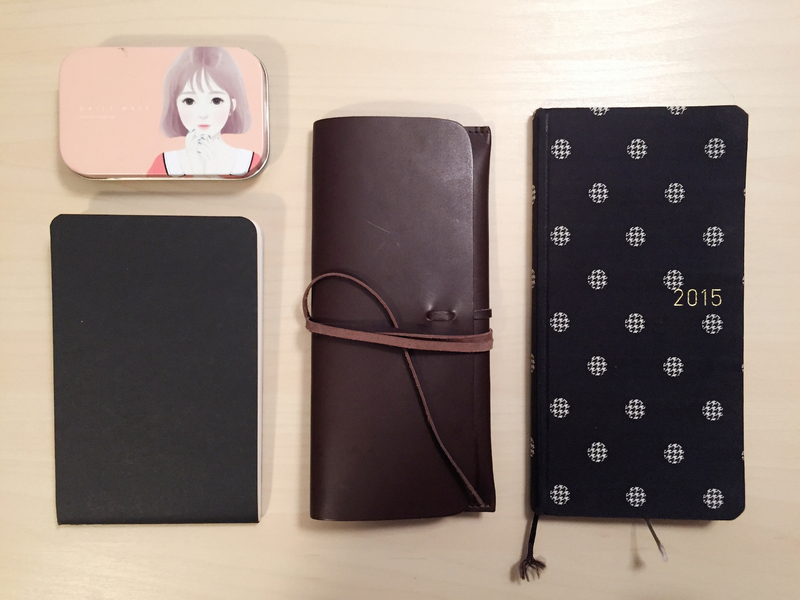 This is another variation of my writing tools when I am bringing my Hobonichi Techo out to play. The additions will be fountain pens and different nibs of the waterproof pigment ink pens. The two fountain pens displayed on the left are Pilot Prera; they are light, classy looking, and writes smoothly. I actually own about 5 to 6 fountain pens and I filled them up with different inks in each pen. It’s a crazier addiction, because soon you want to have all the different colours and you think you would use every one of them in your diary (when you really don’t). 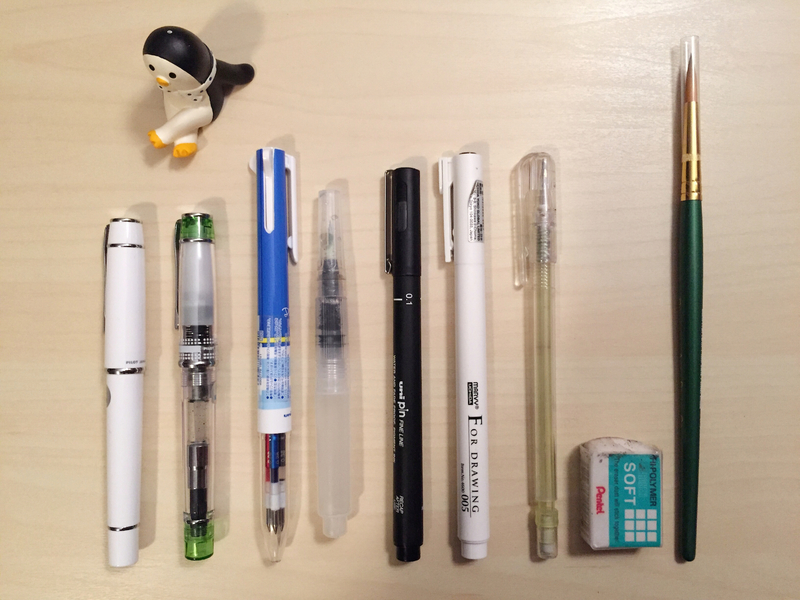 I’m glad I left the town of stationery madness that is Taiwan, and my wallet is safe from temptation. The three brands of waterproof pigment ink pen I own are Uni pin fine-line, Sakura Microns, and Uchida. My favourite nib types are the 0.05, 0.1, and 0.5 as they cover almost all types of strokes I want in my doodles. Lastly, the addition is pencil and a real water-colour brush. I’ve been practicing more techniques in urban sketching and one of the most important thing is perspective (making sure the buildings look smaller when they’re far away, the slanting of the walls as they disappear in the horizon…etc). I used to draw free-style with the ink at first glance. However, now I’m learning to draw a light draft with the pencil to map out the horizon line. The water-colour brush I own is from Princeton Art & Brush Co. and I like it because it is not too long and can fit in my pen case. Although the water pen is very convenient for light doodling, the water released through each stroke dilutes the pigment of the paints as you draw. I’m forcing myself to use bolder color so I must be familiar with using a real water-colour brush LOL. 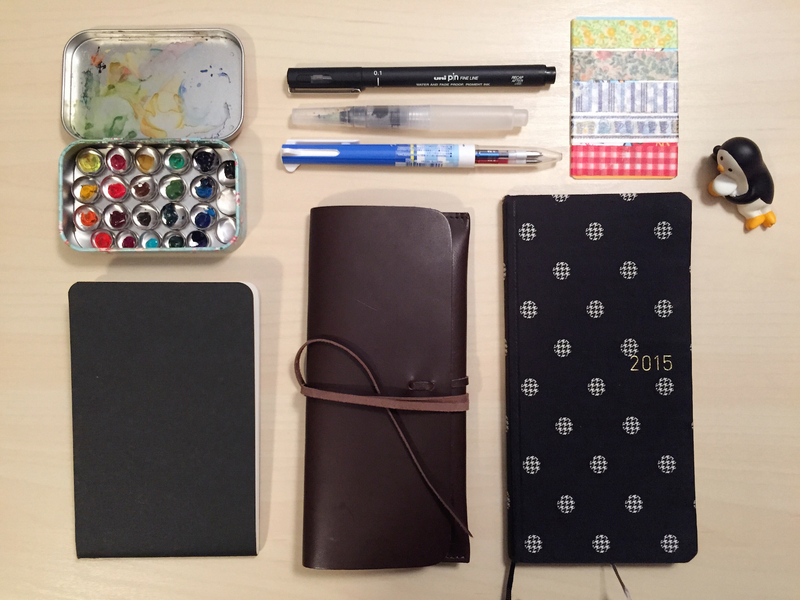 So there, that’s my on-the-go stationery set up! 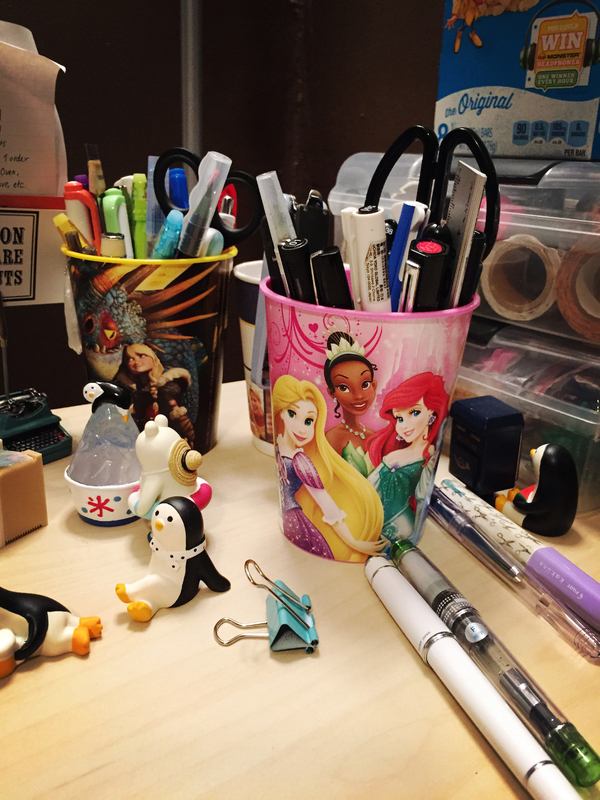 You must be shaking your head and thinking, what about all the other pens and stationery tools you own! I’m shaking my head and wondering about the same thing. Perhaps I’ll start writing about them in future posts. Meanwhile, here’s a sneak peak at my hoard on my table top (I try to keep them in clear view so I would use them more). I couldn’t find any good pen holders here in the States around my house. How I yearn for Daiso! Meanwhile, these 99 cents party cups would have to do. Loved it, thanks for doing this ^^ you’ve made me relook at my to-go again. I always overestimate what I’ll end up using sigh. Reblogged this on everything is writing. Just found this and funnily enough I use a classy bathroom tumbler for my pens/brushes hehe.